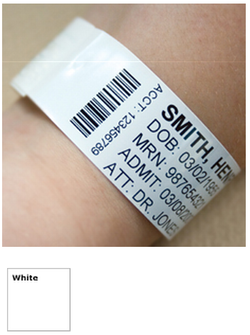 The Zebra Wristbands make a great solution for the Pediatric Department because the Direct Thermal Wristbands feature an inorganic ionic silver coating that kills microorganisms that come into contact with it. As the silver ions are taken into the microorganisms they react and bond to the cellular enzyme. This inhibits the microorganisms exzyme activity and multiplication, which eliminates the., protecting your hospital or medical facility from tragic and expensive errors. Because patient information does not smear and stays readable, hospital staff and doctors and most bar code scanners will provide a positive patient identification.